It has been said that microfibre technology is the most significant product innovation in the cleaning industry in the last century. This advanced material consists of thousands of tiny microscopic fibres which will glide effortlessly across wooden floors and actively lift up dirt and grime more effectively than traditional mops. Mopping is transformed from a dreaded chore into a quick and simple task. Our microfibre mop can be used dry which reduces the risk of damaging wooden floors with too much water. Once mopping is complete, simply remove the mop pad and clean in a washing machine. Our microfibre mop pads can be washed hundreds of times before they need to be replaced. 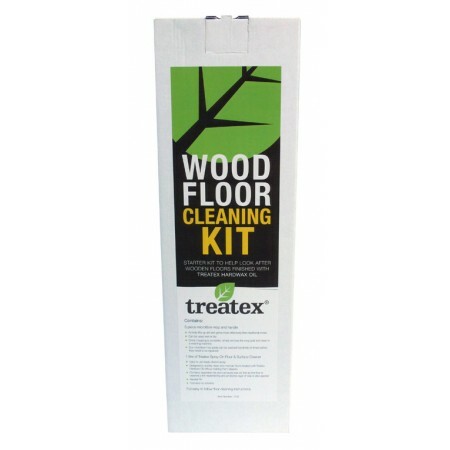 Treatex Wood Floor Cleaning Kit also contains 1 litre of Treatex Spray On Floor & Surface Cleaner which is designed to quickly clean and maintain floors finished with Treatex Hardwax Oil without making the surface slippery.